Although Transition Design is complementary to/borrows from a myriad of other design approaches, it is distinct in its emphasis on: 1) Stakeholder involvement in mapping wicked problems in order to achieve a shared understanding; 2) Resolving stakeholder conflicts and leveraging areas of alignment; 3) Developing compelling long-term future visions as a way of transcending differences in the present; 4) Framing problems and visions within radically large, spatio-temporal contexts; 5) Thinking in terms of ‘systems interventions’ instead of one-off solutions; 6) Referencing principles from living systems (self-organization, emergence, etc) as a way of understanding the dynamics within complex systems and wicked problems; 7) Conceiving interventions that protect and restore both social and natural ecosystems; 8) Everyday life/lifestyles are seen at the the most fundamental context for conceiving solutions/interventions; 9) Cosmopolitan localism, a place-based lifestyle that is global in its awareness and exchange of information technology; 10) Interventions are designed and implemented at multiple levels of scale, over short, mid and long time horizons; 11) Identifying emergent/grassroots solutions and amplifying them; 12) Linking both new and existing solutions into ‘ecologies’ of interventions that become steps in transitions toward desirable, sustainable futures; 13) Basing designed interventions upon genuine ‘needs’ vs. wants/desires; 14) Viewing the designer’s own mindset/posture as an essential component of the design process; 15) The reintegration and re-contextualization of knowledge, that is necessary for doing this work. Problems take a long time to become wicked, just as unsustainable ways of living evolved over long periods of time. For this reason, it will take dozens of years, or even dozens of decades to shift our current trajectory and resolve the wicked problems facing us in the 21st century. Transition Design argues that problems must be framed within radically large spatio-temporal contexts in order to understand their origins (root causes) and identify both past and current, contributing factors at multiple levels of scale. In this class, students will be introduced to the Spatio-Temporal Matrix; a framework for guiding research to identify the root causes and consequences of a wicked problem and as a tool for developing high-fidelity visions of sustainable futures (in which the problem has been resolved). Assignment #4: The Spatio-Temporal Matrix will be given. See Additional Resources and Assignment #4 pages prior to beginning the readings. How would you characterize the difference between a traditional approach to designing ‘solutions’ and the concept of each solution becoming a ‘systems intervention’? How might this shift in mindset and action produce different results? Why is it important to frame complex, wicked problems within radically large, spatio-temporal frames? How can researching the past, prior to the emergence of the wicked problem, inform interventions in the present? What do we mean by ‘amplifying’ grassroots efforts to become transition solutions? How can living systems theory help us understand wicked problems? What do we mean when we say that transition designers connect existing solutions to visions of transition? How can a future vision inform connecting, amplifying and designing solutions in the present? What does it mean to say that knowledge needs to be reintegrated and recontextualized, and why might designers be particularly suited to this task? What type of transition solution could be undertaken by a single designer? What type of solutions require larger teams and why? Irwin, Terry. 2017. The Emerging Transition Design Approach. Unpublished Material. 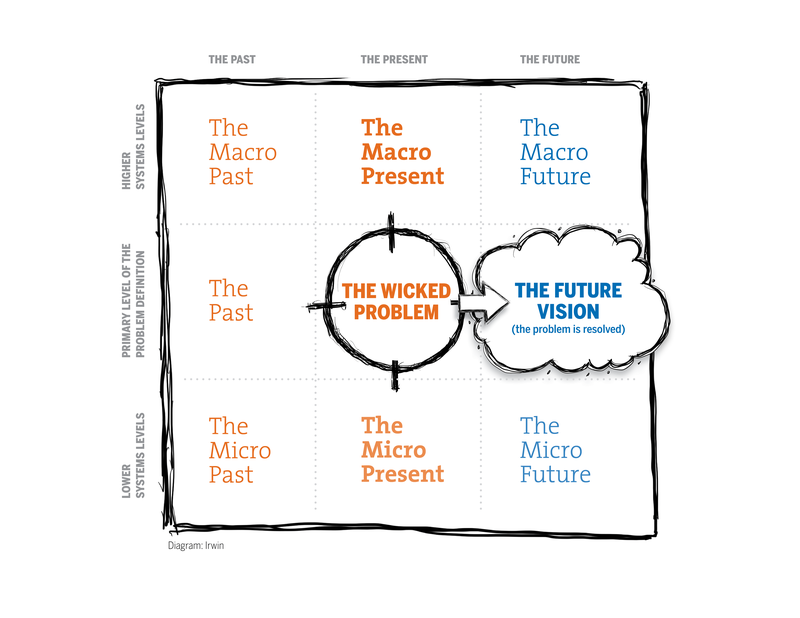 In Assignment 4, teams will use the research conducted about their wicked problem throughout the semester to answer the questions in the past and present columns of the Spatio-Temporal Matrix. They will then use their future vision as the basis for further articulating the vision at the macro and micro levels. A complete description of this assignment can be found on the Assignment 4 page of this website. One of the primary ways that Transition Design differs from other design approaches is its emphasis on ‘design for systems-level change’. Instead of thinking in terms of one-off solutions, that are completed within relatively short time frames, Transition Design thinks in terms of designing ‘interventions’ that are implemented at multiple levels of scale, over short, mid and long time horizons. These interventions have the potential to ‘transition’ the system (a wicked problem, an organization or entire societies) over time, toward new, sustainable/preferable futures. Because we can never predict how a complex system will respond to these interventions (because of their self-determining dynamics), periods of design/action must be balanced with periods of waiting and observing to see how the system responds. This will challenge our dominant paradigms that call for quick, decisive action that yields quick, profitable results. For this reason, Transition Designers will need to create compelling communications and narratives that explain why both action and observation are crucial to designing over long periods of time. In this class we will discuss the emerging Transition Design approach and in particular, how the previous research conducted, along with the assignments, can inform the conceptual development of 3 ‘designed interventions’ aimed at resolving a wicked problem. 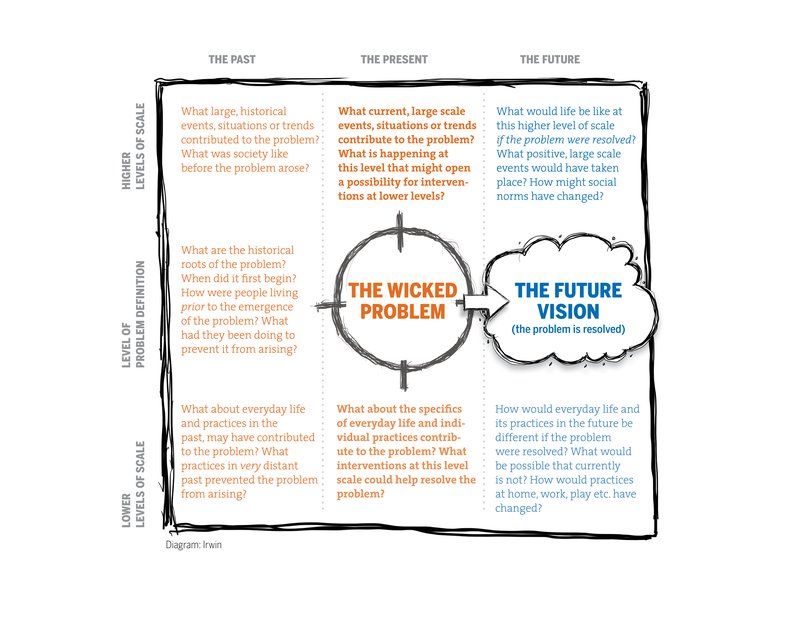 Teams will work with the same wicked problem in the next Assignment #5 to visualize and articulate proposed interventions that can act as a first step along the transition pathway toward the future vision articulated in assignment #4. See Additional Resources and Assignment #5 pages, prior to beginning the readings. Based upon your previous research and familiarity with your team’s wicked problem, what are the most obvious ‘leverage points for change’ in the system? What are the most immediate and relatively easy interventions that could be immediately implemented? Try to imagine interventions at the macro, mezzo and micro levels of scale. How could they be interconnected for greater leverage? Try to think temporally; what are short, mid and long-term interventions that could be proposed? How can you imagine balancing the implementation of multiple ‘interventions’ with periods of observation and waiting? Should this process be staggered, so that transition designers are observing the results of some interventions, while implementing others? How can this process be choreographed and adjusted quickly when necessary? 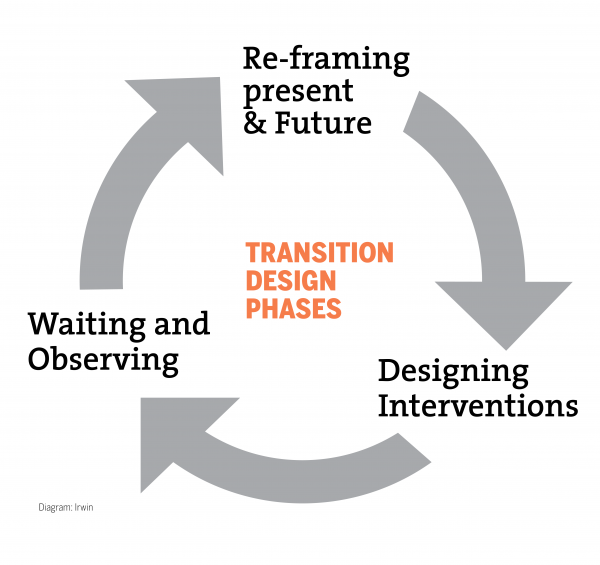 Designing interventions within a large, Transition Design project will require transdisciplinary teams working over long periods of time in a co-design process with stakeholders themselves. How can continuity be maintained over long periods of time when actors are continually changing? What kind of narratives/justifications and evaluation criteria need to be developed to create time for observation and re-orienting (if necessary) with the ‘powers that be’? Assignment #5 asks each team to develop 2-3 concepts for ‘interventions’ that will be implemented at various levels of scale within the system (wicked problem). Teams should explore how best to represent these interventions visually (for instance they might be mapped agains the MLP diagram) and describe the systems level at which the intervention is being proposed and its timeline for implementation and observation. Refer to the Assignment #5 pages for more details on this assignment. In this class, teams will continue to work on conceiving systems interventions aimed at addressing their wicked problem. Teams should continue to develop and reference the Socio-Technical Transition canvas from Assignment #4 which will inform thinking about system interventions. Remember that interventions can be situated at any of the levels within the MLP (the landscape, the regime or the niche). Sometimes large events or changes at the landscape level open up opportunities for experiments or interventions at the niche level which have to potential to disrupt entrenched regimes. Conversely however a strategy to change mindsets, values or cultural norms would be a strategy for change at the landscape level that could in turn destabilize problematic regimes. The project canvas prompts you to ask questions about where an intervention is situated and the ways in which multiple interventions could be connected to each other and a long-term vision for greater traction. Assignment #5 asks each team to develop 2-3 concepts for ‘interventions’ that will be implemented at various levels of scale within the system (wicked problem). Teams should explore how best to represent these interventions visually (for instance they might be mapped agains the MLP diagram) and describe the systems level at which the intervention is being proposed and its timeline for implementation and observation. Refer to the Assignment #6 pages for more details on this assignment. The emerging Transition Design approach is aimed at long-term, systems-level change and aspires to: Enable practitioners and researchers to identify the consequences of wicked problems and “trace” them up and down systems levels to determine root causes (it is often far easier to see the consequences of wicked problems than it is to identify root causes); facilitate an understanding of stakeholder concerns and resolve conflictual relations; contextualize wicked problems within the large, socio-technical systems out of which they evolved over dozens of years or even decades, in order to resolve them (traditional, decontextualized design approaches fail to frame complex problems within these large problem frames and therefore neglect to identify their historical origins and roots); establish a process in which stakeholder groups co-create visions of desirable/sustainable futures, which enable them to transcend their differences in the present; shift designers’ focus from ‘one-off’ solutions to the creation of ‘ecologies of interventions’ implemented at all levels of scale and time horizons, that begin to transition the system toward more sustainable futures. This class will be divided between a concluding discussion of the semesters work and the concepts introduced and meetings with instructors and the project teams to provide feedback on Assignments 4 & 5 which are due as Medium posts on 5.8.19. See Additional Resources and the Assignments section of this website prior to class. What distinguishes Transition Design from other areas of design focus such as design for service and design for social innovation? In what ways can a service design or social innovation solution become a transition solution? Is it possible to design for multiple levels of scale and longer horizons of time? How can design projects and initiatives be framed and implemented so that they are ‘steps’ in longer transition solutions? How might the emerging Transition Design approach be developed? Why do new ways of designing, in particular Transition Design, need to be underpinned with a more ecological worldview, ecoliteracy, and place-based knowledge? An overview of a 2017 Transition Design short course in Majorca, Spain shows how different tools correspond to the Transition Design Framework.